Hope you enjoy the video!! Just wanted to share a quick card using some leftovers. Have a great day! I needed to get out of the cleaning mode for awhile! I just needed to make a card and think of warmer weather! This is just one of my Easter cards. I pulled out some of the goodies from my stash basket and threw together. Turned out pretty good. I'm hoping to get back to a routine posting again. I have 2 tables full of "stuff" for my Spring Cleaning Sale. I just need to price it and pick a date. Hopefully a date when it's not raining or snowing.LOL Hope you have a great day! During Sale-A-Bration you can join and become a Stampin' Up! demonstrator. Join for only $99 and you'll get to choose $150 worth of products. This offer ends March 31st. Just sayin'-- these six positive sentiments will let someone know how much you appreciate them. And the Word Bubbles Dies make cutting the Just Sayin' images quick and easy. One beautiful flower, six gorgeous designs--it's the stamp set that keeps on giving! And the Petite Petals Punch makes cutting the Petite Petals images quick and easy. Buy the Petite Petals wood-mount stamp set and coordinating Petite Petals Punch together at a 15% discount. Good Morning! First I wanted to say sorry about that "froggy" voice. This back and forth Spring to Winter is playing games with my voice. I hope you enjoy the video. I did trim all around the hexagon piece I'll post the finished card later today. Have a great day! Oh yeah! Sale a Bration ends March 31st don't forget!!!! Here's a close up of the card I made in the video. I was really happy with how this one came out. Hope you're having a great day. Oh yeah! there are just two opening in each of the April 18th classes! Sign up quick if you want to join us. Just messing around in the studio. Still going through all this "stuff" and pulling out goodies for the Spring cleaning sale. I just had to stop and do a video. Hope you enjoy it! Have a great day! Yeap! I really did do this on Monday, but really late and it didn't post on YouTube until after I went to bed ! Oh well, here it is. I hope you enjoy the video! Have a great day!! Well, sorry about that! I've been Spring Cleaning a little early. I'm cleaning the two studios and getting rid of TONS of stuff. I'm going to have a Crafty Spring Sale sometime soon. Hopefully all my extra stuff will be something other crafting folks would love to have. Steve put together a couple new Ikea storage units (I'll take pics when all finished in the studio makeover), for me and that got me going. I did find time to surf the web and see what everyone out there is doing and I stumbled across this one, at I think Freshly Stamps site. I change it just a bit but wow is this awesome or what?!? I just did a card class using the Six Sided Hexagon bundle from Stampin Up and sure wish I had seen this before that. Hopefully you all will give this a whirl. I LOVE THIS CARD!!!. I am going to have it on the display board at next class, because we are doing a butterflies theme and well there they are. The next class is April 18th if you are interested there are only 3 spots left for the morning class and 2 in the evening! Have a great weekend, I'm going to keep on cleaning out! These are the new stamps we have at Stampin UP. ﻿Just click here to get yours today. Get them today while supplies last! 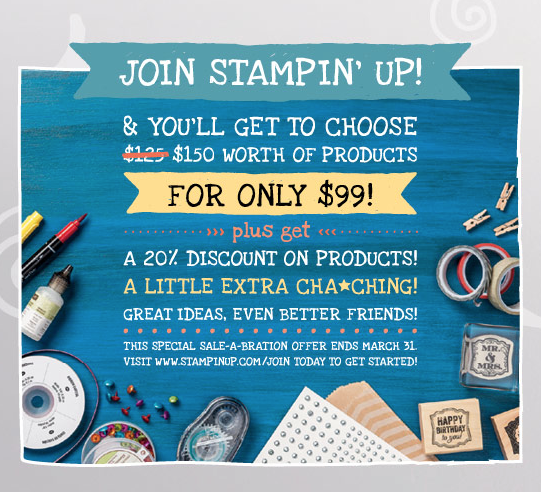 Remember : Sale-A-Bration ends March 31st Earn a free Stampin' Up! product for every $50 you spend. Well, this was suppose to upload yesterday..opps! Hope you have a great day! This is the card you can see in the video. Hope you're having a great day! Just a quick video to show you what I've been up to in the studio. Have a great day! 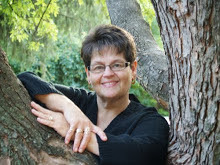 Just wanted to let you know I'm having problems with uploading on my blog. I do have a video to edit and upload tonight. So, hopefully it will work. SORRY! A long time ago I went and got my Copic Certification and this is the giraffe I did in class. I found it in a box and decided to make a card. I used Stampin Up ribbon and button. Not sure what I use it for or if I'll just put it in my Project Life Album as an embellishment. Hope you having a great day! I have a couple spots left in the class March 7th, if interested give me a call to get registered.